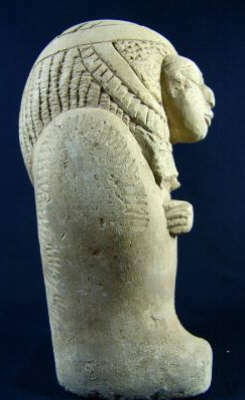 Ancient Egyptian "Rare Ptolemaic Female Ushabti"
The above listed item is from the Ptolemaic Period,(332-30 B.C.E.). This incredible "Female Ushabti" was cast from clay. We acquired this rare and wonderful piece from a select private collection and its provenance is from Alexandria, Egypt. With her head extending forwards, she is wearing an elaborate Nemes headdress, arms folded and her body is detailed with chevron-like symbols. This unusually rare piece is in exquisite condition with age wear. The reason for the item being available is due to the vast extent of archeological findings, thousands of years in Egyptian burials and also the proliferation of these said items in older private collections worldwide. Ushabtis are one of the most popular Egyptian collectibles, they are a good investment, long lasting and a true example of the Egyptian funerary culture.Dimesions: Height:20cm Width:8.2cm Depth:11cm. We always do our best to make all of your transactions easy and comfortable. Our ideal is to offer our customers every opportunity to acquire an Egyptian anitquity without the high end gallery price tag. Know that we stand firmly behind all of our fine products, guarantee and easy return policies. You have nothing to lose so, Bid with the Utmost Confindence! ".